By nature I expect things to be complicated. When it turns out a thing is simple it feels like magic. Do you know what I mean when I say tea possesses a de-frazzling effect? Besides the flavor and aroma, and the pleasing tink of china on china, tea requires us to suspend all other activity and focus on the ceremony of preparing a perfectly brewed pot. Cut 3 stalks of mint low on the stem. Rinse under water; dry with a clean kitchen towel. Roll stalks firmly and briskly between the palms of your hands. 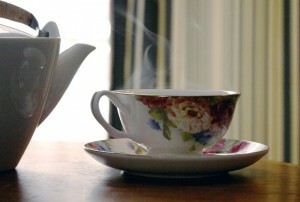 Form a nest with the stalks in the bottom of your teapot. Pour boiling water into the pot. 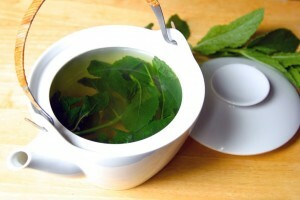 Steep 4 minutes before enjoying (leave the mint in for stronger tea). The flavor of natural mint tea is light and sweet and equal to any of the commercially-produced teas on which I confess to spending a small fortune. 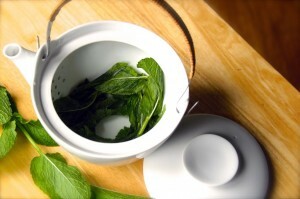 As a bonus, rolling stalks between your palms releases mint oil that aromatizes the air. Sorta like a soothing Glad air freshener, except it’s free and won’t poison your kids or pets if they eat it. Magic, indeed. It does. All members of the Lamiaceae are mild nervous system suppressants and have an anxiolytic effect. But the tea ritual works even if you are making another kind of tea!